Brexit: on becoming a "third country"
I actually saw a website recently which suggested that the UK could adopt "third-country" status on leaving the EU. Although written in the context of financial services, it nevertheless betrays the mindset – one of staggering proportions – of those people who are completely failing to understand the implications of Brexit and Mrs May's retreat from the Single Market. A major part of the problem, I rather feel, is the inability to see the situation through the eyes of the EU. Thereby, people simply fail to understand that, when we leave the EU – and also the EEA – we automatically assume the status of "third country". It cannot be emphasised enough. The EU does not do this to us – we do it to ourselves. Our exporters then have to look at the EU through new eyes. No longer are they part of the vast Single Market, where goods shipped from the UK to mainland Europe did not come under customs control. Instead, like any other "third country", we come under the full panoply of customs controls. To get a taste of what that involved is easy. Simply go to the export website of another third country and follow the instructions – the United States is as good as any. Before they even start, putative exporters are advised to consult the TARIC (Tarif Intégré de la Communauté), website to help determine if a licence is needed. Not only are there EU restrictions, many EU member states maintain their own list of goods subject to import licensing. For example , we are told, Germany's "Import List" (Einfuhrliste) includes goods for which licenses are required, their code numbers, any applicable restrictions, and the agency that will issue the relevant license. Once that hurdle is overcome, the exporters must prepare their written declarations to customs, in the form of the Single Administrative Document (SAD), an eight-part document running to a minimum of twelve pages. The SAD describes goods and their movement around the world and, effectively the passport for the goods, needed to secure their entry into the EU customs territory. Even without going any further, there is a significant cost element here. Mistakes in completing the SAD can lead to expensive hold-ups at the posts, so many firms hire customs or shipping agents, paying anything up to £60 for each form submitted. In order to fill in the form, exporters will normally be required to enter their Economic Operator Registration and Identification (EORI) number. This has to be formally requested from the customs of the specific member state to which the company exports. Thus, for a UK exporter planning to ship their goods to or via France, they will have to go to the French website for the details and to make an application. Member state custom authorities may request additional documents to be submitted alongside a formal request, and it can take anything up to two or three days to be issued. Of course, currently, almost every UK exporter will already have an EORI number but, on Brexit day and thereafter, these will probably no longer be valid, as they can only be issued by EU Member States. There is a possibility that we could negotiate an agreement with the EU for continued recognition of the numbers issued by the UK Government but, in the event of talks breaking down, we would have to start from scratch. That could create significant problems as UK exporters would no longer exist on the EU's centralised customs database. Then there is a matter of the mutual recognition of Authorised Economic Operator (AEOs). We deal with this in Monograph 11. Since 1997, the US and the EU have had an agreement on customs cooperation and mutual assistance in customs matters. This is the country that doesn't have any trade agreements with the EU, of course – except that it does, with details of the customs agreement here. In 2012 the United States and the EU signed a new Mutual Recognition Arrangement (MRA) aimed at matching procedures to associate one another’s customs identification numbers. The EU customs code introduced the Authorised Economic Operator (AEO) programme (known as the "security amendment"). This is similar to the United States' voluntary Customs-Trade Partnership Against Terrorism (C-TPAT) program in which participants receive certification as a "trusted" trader. AEO certification issued by a national customs authority and is recognized by all member state’s customs agencies. As of 17 April 2017 an AEO can consist of two different types of authorisation: "customs simplification" or "security and safety". The former allows for an AEO to benefit from simplification related to customs legislation, while the latter allows for facilitation through security and safety procedures. Shipping to a trader with AEO status could facilitate an exporter's trade as its benefits include expedited processing of shipments, reduced theft/losses, reduced data requirements, lower inspection costs, and enhanced loyalty and recognition. Under the revised Union Customs Code, in order for an operator to make use of certain customs simplifications, the authorisation of AEO becomes mandatory. The United States and the EU recognise each other's security certified operators and will take the respective membership status of certified trusted traders favourably into account to the extent possible. The favourable treatment provided by mutual recognition will result in lower costs, simplified procedures and greater predictability for transatlantic business activities. The newly signed arrangement officially recognises the compatibility of AEO and C-TPAT programs, thereby facilitating faster and more secure trade between US and EU operators. The agreement is being implemented in two phases. The first commenced in July 2012 with the US customs authorities placing shipments coming from EU AEO members into a lower risk category. The second phase took place in early 2013, with the EU re-classifying shipments coming from C-TPAT members into a lower risk category. The US customs identification numbers (MID) are therefore recognised by customs authorities in the EU, as per Implementing Regulation 58/2013. which amends EU Regulation 2454/93. If the UK is to have a similar facility, then there would need to be some detailed negotiations within the Article 50 framework, to ensure arrangements are in place by the time we leave. This notwithstanding, exporters will have to get used to preparing other form in addition to their SAD documents. They will also need Entry Summary Declarations (ENS), which have to be lodged at the customs office of first entry, once the items have been presented to customs officials. They have to be lodged by the people who bring the goods, or those who assume responsibility for the carriage of the goods into the customs territory. In return, they will receive the MRN – Movement Reference Number –a unique number automatically generated, upon validation, by the customs office that receives the ENS. The MRN must be issued immediately to the person lodging the ENS and, where different, also to the carrier. The MRN contains 18 alpha-numeric characters. I have no doubt that this is not a collector's item and actually has a use. US exporters are also warned that they will need to make special arrangements for selling batteries within the EU, for chemicals within the REACH system, the Waste Electrical and Electronic Equipment (WEEE) Directive, the Restriction on Hazardous Substances (RoHS) Directive, and the Cosmetics Directive. Then there are the provisions for Agricultural Documentation, including meat and meat products, about which we have written previously, but exporters are warned of the need to acquire the appropriate export certificates before the goods are shipped. The thing is, these rules are not exactly secret – you just need to know where to look for them, and have the incentive to do so. And those who would simply poke their heads in the sand would do well to heed the words of Robert Edminson, an ex Customs Officer who made a comment on the Booker column last weekend. Having dealt with imports and exports for many years he was "delighted" that Mr Booker had started explaining the actual detail of international trade, much of which is unknown to the general public, as it is highly technical and has been built up over the years. to allow three days to do all the documentation and get a vehicle out to the CE-BIT electronics show in Hanover having signed personal guarantees that every item, separately listed, (please list fittings that have detachable pieces in their exploded form) would be returned to the UK. On pain of forfeiting the personal guarantee. Post Maastricht, no documentation, no queues, no PG's and we sold the goods we took out there off the stand on the last day. Should we have a Hard Brexit, he says he'd rather just move the company to Lille or Rotterdam than go back to that. "I can't imagine how Dover will work if we try and put the clock that far back", he added. "Tweak security up one level and this whole corner of South East Kent gums up. Reinstitute the border controls of 1992 now and this part of the world will stop functioning". In 1991, the last time I did the CE-BIT run pre-Maastricht, I was behind the Sony artic [truck] bound for the same destination. A Customs Officer, who looked about 14 years old, said to the driver "We only want to see these six items". The driver opened the back of his truck, revealing about 20,000 cardboard boxes, almost all of which were plain and unlabelled. "I'll have to unload the whole truck" he complained "Well you'd better get started" said the CO. He ended up calling Sony HQ who helicoptered a crew to Dover to help him. On the same trip, at Ghyveloe, going into Belgium from France, there was only one officer on duty (carnets have to be stamped at every border you cross, of course, in and out) and the queue was five hours. Nothing by today's standards when even the smallest things go wrong. If you go and stand on the ridge at Arpinge above Folkestone or East Langdon Cliffs at Dover, you can watch the whole system creaking desperately at the seams. After Hard Brexit, you'll be able to watch it sink. …closes swathes of motorway whenever there is an incident on the ferries or tunnel. All Kent ports as well as the Cheriton access to the tunnel are at risk. I challenge any Brexit voter to sit on the lovely hills above Folkestone or Dover and watch the sheer volume of lorry traffic passing between the world's 5th and 6th largest economies to realise the foolishness of reverting to detailed inspections of every vehicle. The cost would be vast. Utter madness to contemplate or threaten. These are not fantasies by swivel-eyed loonies, but sober appreciations based on what went before. Dover as a port works, but only just. 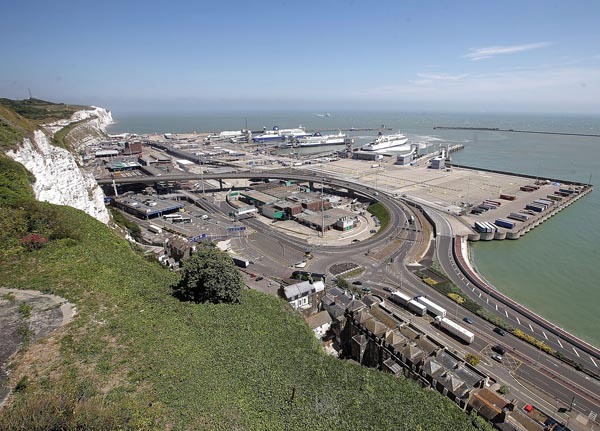 The slightest perturbation brings delays and the introduction of "third country" customs controls to Calais will have a knock-on effect in Dover that will be impossible to manage. My guess is that, after a period of chaos, this could bring permanent change. The roll-on, roll-off traffic will be drastically cut and many of the goods will be containerised and diverted to inland ports such as Doncaster. They will then either be transported through the tunnel on freight trains, or by ship through a container port. Customs checks on unaccompanied loads, although still onerous, are less troublesome than on lorry-borne freight. You can stack containers if there are delays, while Operation Stack for trucks means massive queues. Either way, this problem is not going to go away. Mrs May intends to take us out of the Single Market. Dover may look the same, outwardly, but that turns us into a "third country", with inevitable and unavoidable consequences.